Disclaimer: Build, Install the sources at your own risk. Your system may become unusable unless you reinstall fresh in case you failed this step. I tried this risk thinking of installing debian squeeze in case I unset my running Ubuntu audio, fortunately it worked! I noticed one mistake in your tutorial (i think it's mistake). The package 'build-essentials' is 'build-essential'. Anyway thanks a lot! Alsa didnt start for me either on 2.6.38rc4 kernel. Same messages as 3 posts above. Reinstalled kernel downgrading ALSA back to 1023. Thanks this worked great. This has actually improved my audio experience, unless of course I'm suffering from your same Placebo effect. Now my sound is back! Great Posting !! 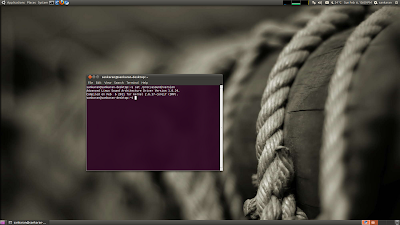 I tried a lot from last 3 days to make my laptop sound play with Ubuntu 10.4. Finally it worked for me with this stuff. Thanks a lot. So sad to hear this, can you try going back to 1.0.23 by following the article. = hp pavion with h67 mainboard (b3 stepping),i5-2400 cpu. appears that alsa prior to 1.0.24 does not support this hardware. This worked on the first try on my Asus EEE 1001PX with Ubuntu 10.04. Finally my mic works! Thanks! Confirmed, the above comment makes it work!!!! ahora funciona bien ,gracias !!! my country argentina .saludos ! thanks for made this blogs it helps me many times. But i would automatise the stuff. I mean, i want to put all the commands in a script.sh . Did you know how to do that? because there many "sudo" and i really don't how manage that think. Actually i never do a script in this way by my self, and i want to learn.